House Can Fulgencio II. 2.4 km from the centre of Sant Carles, 3 km from the centre of Es Canar, 6 km from the centre of Sta. Eularia del Riu, 2.8 km from the sea. 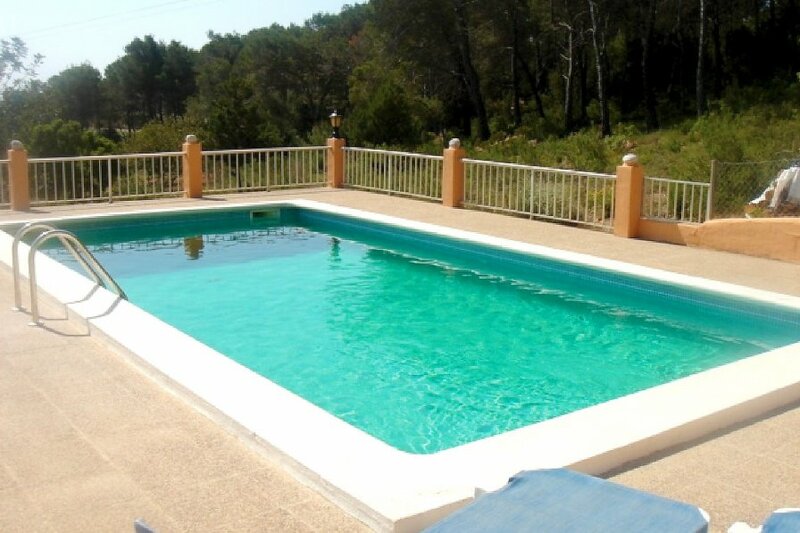 Private: property 75 ha, garden 125 m2 with wildlife garden and trees, swimming pool (4 x 8 m, 15.04.-30.10.). Outdoor shower. Motor access to the house (300 m via unmade road). Grocery 2.4 km, restaurant 2.4 km, bus stop 900 m, sandy beach 2.8 km, outdoor swimming pool 3 km. Tennis 500 m. Part of the 75 ha. of grounds are cultivated or wooded. Closest beaches at Cala Nova and Cala Llenya, approx 2.8 km.